In April, the North Central Texas Council of Governments (NCTCOG) presented the final summary report on the financial and operational struggles of TAPS (Texoma Area Paratransit System). The final report included a summary of findings regarding TAPS assets and resources (vehicles, grant awards, etc. ), as well as recommendations for future operations of transit agencies across the region. I’ve been asked many times for an update on TAPS, so I have taken this opportunity to provide a broader summary of the history of TAPS in Collin County. 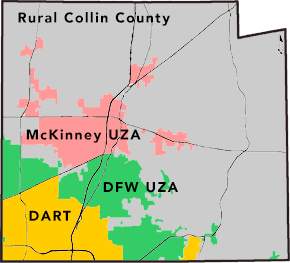 TAPS is the public transit agency that served rural Collin County, the McKinney urbanized area (UZA), and the DFW urbanized area (UZA) in Collin County from 2013 until 2015. Financial troubles at the agency brought to light in 2015 ultimately resulted in the cancellation of all service contracts the agency had in Collin County. Operational troubles at the transit agency first surfaced in early 2015, as board members began to receive frequent constituent complaints, alleging difficulty scheduling trips, long wait times, and other service problems. At the time, agency executives claimed that these were routine challenges, misleading the board about the true nature of the agency’s finances and operations. In the summer of 2015, the TAPS board of directors was notified by NCTCOG representatives that TAPS had failed to make a payment to a vendor (National Bus Sales) for a vehicle that had been ordered. An initial inquiry revealed that additional invoices from other vendors also went unpaid, including rent payments to the Collin County Meals on Wheels organization that leased space to TAPS in McKinney. It was later learned that repeated calls from vendors seeking payment were concealed from the board by the TAPS executive staff. Once the financial troubles came to light, the TAPS board of directors responded swiftly. At the August 2015 board meeting, the TAPS board appointed me to serve as chairman of an ad hoc audit committee to inspect the organization’s finances, operations, and internal controls. As a Certified Public Accountant, Certified Internal Auditor, and Certified Fraud Examiner, I recognized the symptoms of financial distress, and immediately worked to identify the true nature of the agency’s financial issues. Ultimately, I uncovered a pattern of gross mismanagement, including inaccurate and deceptive communications from the management team to the board, a failure to maintain accurate financial records and reports, a failure to follow basic grant program guidelines, a failure to maintain the agency’s fleet, a $4 million agency debt that had been concealed from the board, and a willful decision by the CEO not to pay IRS payroll taxes. As a Certified Public Accountant, Certified Internal Auditor, and Certified Fraud Examiner, I recognized the symptoms of financial distress, and immediately worked to identify the true nature of the agency’s financial issues. Ultimately, I uncovered a pattern of gross mismanagement, including inaccurate and deceptive communications from the management team to the board, a failure to maintain accurate financial records and reports, a failure to follow basic grant program guidelines, a failure to maintain the agency’s fleet, a $4 million agency debt that had been concealed from the board, and a willful decision by the CEO not to pay IRS payroll taxes. In September of 2015, I presented my findings to the board of directors in an open meeting that included members of the public and the media. At that meeting, I laid out everything the committee had uncovered in the internal audit, and I shared my assessment that the agency was facing significant financial challenges and the ultimate survival of the agency was uncertain. At that meeting, the agency severed ties with the CEO, and the chairman of the board resigned. At the next board meeting in October 2015, I was elected by the board to serve as the chairman of TAPS. I am proud of the fact that my fellow board members entrusted me to lead the effort to save the agency, disheartened as I am with the result. Working with the interim CEO, I directed the staff to implement a recovery strategy in three parts: (1) reducing service levels to match the agency’s funding, (2) pursuing reimbursement for eligible expenses already paid by the agency, and (3) restoring cash flow through financing arrangements with state, regional, and local transit partners. Unfortunately, over the next several weeks, we discovered more problems and challenges, one after another. The most significant finding involved the possibility of financial fraud and/or theft of state funds. Based on that discovery, I contacted a director at the Texas Health and Human Services Commission (the state agency that oversees the medical transportation program funding) to share my findings and my concerns. I’ve been asked several times about the ultimate resolution of the subsequent state investigation, but I have not been privy to any updates in that regard. At the November 2015 board meeting, I proposed a plan to suspend all TAPS services until further notice, with the full knowledge that the agency’s cash flow was at a critical level. After discussion, the board of directors rejected that plan and elected to pursue a strategy of reduced (rather than suspended) services, over my objections. Unfortunately, within a few weeks, the agency was effectively insolvent, unable to cover the costs of reduced transit services and payroll expenses. Ultimately, I stepped down as the chairman of the board in December 2015 once it became clear that continuing in the same direction would only further threaten the viability of TAPS and risk Collin County taxpayer resources. At that point, I was convinced that it was time to seek a new direction forward for Collin County citizens. I’m dismayed that TAPS did not serve the community as we had intended, and I’m disappointed with the mismanagement and deception of the TAPS executive staff. As an advocate for TAPS at the outset and a member of the board of directors, you can imagine how frustrating the process was for me as I worked to uncover the full depth of problems at the agency. Even now, my greatest regret is for the citizens who depended on the service and were left without options, as well as the employees who worked diligently and valiantly to save the organization but were left without final paychecks. However, while I lament the failures of TAPS, I don’t for a minute regret working every day to improve our community and serve our citizens.